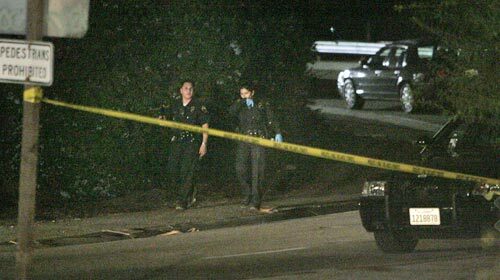 Just like the murder three weeks ago of a homeless man in the Rampart area of Los Angeles, the police have not figured out who murdered the five homeless persons in Long Beach, a large city just south of Los Angeles. Of course, having five people shot to death has rattled this local neighborhood. KCBS2/KCAL9 has video from the crime scene here. LBPD Deputy Chief Robert Luna said it took police awhile to find the bodies, because the area – between the Santa Fe offramp embankment and a business on Wardlow Road – is thick with brush and debris. Luna said authorities are still trying to find out when the shootings took place. “We still haven’t determined the time they were killed, if it was last night or this morning,” he said. Some residents who talked to the Press-Telegram recalled hearing gunshots between 12:30 a.m. and 1 a.m. Sunday. According to Luna, the LBPD handles most homeless cases along the Los Angeles River and officers are not very familiar with this homeless encampment because the area falls under California Highway Patrol’s jurisdiction. Both agencies will be participating in the investigation. Although the victims were found in a homeless camp, police could not confirm if they were homeless. Although investigators can’t confirm if drugs played a role in the deaths, several residents who spoke to the Press-Telegram say the area is often the scene of drug activity. Vince Jackson, who has lived in the neighborhood since 1965, recalled how he used to play near the embankment as a child, but today, he often sees all sorts of people there. Until further investigation, police are not ruling it out. This entry was posted in Long Beach and tagged 187, homeless, homicide, Long Beach by Frank Girardot. Bookmark the permalink.